Did you ever format a hard drive, only to realize that the computer doesn’t have a DVD or CD drive? Maybe you thought the computer could be booted from a USB drive, but the version of the BIOS doesn’t allow for that? Having a bootable version of Windows on a DVD and a USB drive can be a real lifesaver. Today you’ll learn how to create bootable versions of Windows ISOs on DVD and USB. Any file that ends in .iso is an exact copy of a disk. It’s a virtual copy of a CD or DVD, with the same file structure and the same data. ISO copies are referred to as “images” of the original. The acronym ISO comes from the name of the organization responsible for creating industry standards—International Organization for Standardization. Yes, that should be IOS, but they figured ISO was better across all languages as ISO is derived from the Greek isos, meaning “equal”. In this case, the ISO is a perfect copy of what would be on an original Windows CD or DVD. Any media, whether it’s a hard drive, USB flash drive, CD, or DVD is bootable if you can use it to boot your computer. In this case, we are creating portable media which boots from the USB drive or disc, instead of the computer’s hard drive. When installing Windows, the media you use must be bootable. By far the easiest way to create Windows 10 bootable media is to use the Windows Media Creation tool. The software is available as a free download from Microsoft. Update the system to Windows 10. 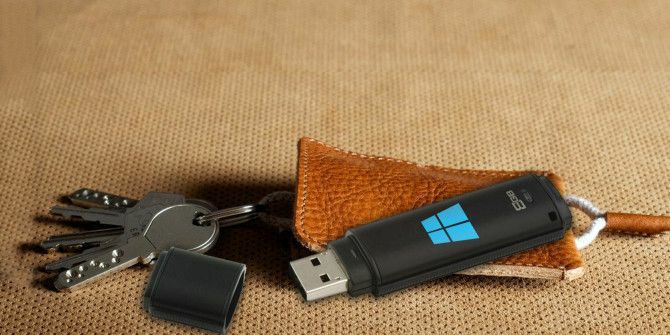 Create a Windows 10 bootable USB stick. Download a Windows 10 ISO file to your computer. The first two options on the list require simply following instructions in the tool, and you won’t need to deal with an ISO file at all. You are given the option of downloading a 64 bit version, a 32 bit version, or both. There is also an option to Use the recommended options for this PC. If you don’t know which one you need, use this setting ! For 32 bit Windows installations, 4GB is the minimum size USB stick that will work. For 64 bit, you’ll need 8GB minimum. It is advised to use something a little larger where possible. Note that this will wipe the contents of the USB drive so be sure to back up any data you want to keep first. You can get a Windows 7 ISO direct from Microsoft, but you will need your 25 character product key to start the download. You can find your Windows Product Key either with the original installation media or in an email from Microsoft from when you originally bought it. Be aware, for this method to work, you can not use an Original Equipment Manufacturer (OEM) key. It has to be from either a Windows installation disc or from a previously downloaded ISO purchased from Microsoft. What If I’ve Forgotten My Product Key? When you purchased Windows you will have received either a 25 character product key or a digital license. You can install an operating system without either of these, but you won’t be able to activate it. If you lost your product key, there are ways to find it again. The Magical Jelly Bean KeyFinder has a free version which will display your CD Key as shown above. Alternatively, you can follow the advice provided by Microsoft on finding your product key. Windows 8.1 is still available to download from Microsoft. Getting the ISO requires no product key, though you will need one when you try to install it for the first time. The simplest way to create a bootable USB drive is with Rufus. Download, and open it by right clicking on it and selecting Run As Administrator. Select your USB drive from the Device dropdown menu. Click Select by the Boot selection drop down and locate your Windows ISO file. Give your USB drive a descriptive title in the Volume Label text box. Rufus gives you the option of using a GPT file system for UEFI systems, and MBR for BIOS systems. Rufus can detect what system you have, and usually picks the right one for you. If you don’t know what kind of system you have, let Rufus choose for you! There are alternative tools to make bootable USBs 10 Tools to Make a Bootable USB From an ISO File 10 Tools to Make a Bootable USB From an ISO File Installing an operating system from a USB drive is quick and portable. We test a few ISO to USB tools to find the best one for you. Read More , and if Rufus doesn’t work for you, one of them will! There are several programs out there which will burn an ISO to a DVD and make it bootable. Burnaware is simple to use The Best Way to Burn CDs and DVDs on Windows 10 Is With BurnAware The Best Way to Burn CDs and DVDs on Windows 10 Is With BurnAware If you're looking for a free disc burning utility that's fully-featured, BurnAware is for you. Read More and has a free version for home use. To create a bootable DVD, open Burnaware and click on Burn ISO. Click Browse and locate your Windows ISO file. Insert a DVD and click Burn. Alternatively, you can use Window’s native ISO burner. Right click on your ISO file and select Burn disc image. This will open the native burner. It couldn’t be simpler to use, just enter a DVD and press burn! Note that whatever method you choose, DVDs only work for 32 bit Windows installations due to their small capacity. Using a USB installation instead is strongly recommended. Now you have a bootable version of Windows in your pocket or on DVD. To use it, you might want to brush up on how to change your computer’s boot order first! USB booting is essential in modern computing, and you can even host multiple live operating systems How to Create a Bootable Multiboot USB for Windows and Linux How to Create a Bootable Multiboot USB for Windows and Linux A single USB flash drive is all you need to boot, install, and troubleshoot multiple operating systems. We'll show you how to create a multiboot USB, including Windows and Linux installers and recovery tools. Read More on USB sticks! Explore more about: Boot Errors, CD-DVD Tool, ISO, System Restore, Troubleshooting, USB Drive. "Note that whatever method you choose, DVDs only work for 32 bit Windows installations due to their small capacity." Please be aware that dual-layer DVDs hold up to 8.5GB, enough for any 64-bit Windows installation media, and although almost any DVD burner will handle them, I've found a couple of blu-ray burners that are supposed to handle them but error out (burn failure) when it's time to switch layers (about 50% done). What you guys tell here is just 'burning a dvd' and for that to work one doesn't even need to install a third party app starting from Windows 7. For 'making a bootable disk' to work as per this article the ISO file is also needs to be imaged bootable in itself. If the image 'ISO' file is not bootable in it's existence burned DVD won't work for booting purpose except I guess in the case of Rufus. Explanation of the burning process is great though. Followed the instructions. The DvD I made is not bootable. How do I use RUFUS to change a Windows 7 DVD (not ISO) into a bootable USB thumb drive? I did this. You can insert the installation CD into a optical disk drive, open Rufus, click Add, browse to the CD, click it, select all the folders and files, then click OK. Rufus will copy them. Then, click save, and Rufus will save them in an iso file. as I've already reseted my PC and is in need of a bootable USB state, I currently cannot make a bootable USB, will this work If I do it on another computer? and will it work if this computer was once windows 10 but changed to something that is not windows? If it doesn't does it even work on a windows 10? Hi Guys so i would like to burn the windows 10 free iso so it would work? and i can boot from it? and i can install without any problems right? Hi, The dvd burning process did not create a Bootable disk for me. Hi Sam. I'm glad that worked for you. But that's not what the article said. At the time of writing this, if you wanted to create Windows 7 recovery media through Microsoft’s Software Recovery page, you needed to make sure that you have your Windows 7 Product Key. That method would not work with an Original Equipment Manufacturer (OEM) key. It had to be from either a Windows installation disc or from a previously downloaded ISO purchased from Microsoft. hello holi, the writer is not referring to ISO you are referring to which is related to various companies rendering different services based on ISO standard. please re-read that portion so you will understand. Mostly correct. It's the International Organization for Standardization, but they use the initialization of ISO for some reason. Still, glad you liked the article. Your article has helped me a lot. I bought a used HP Probook 6450b. I can't change the boot order in order to re-install win7. I'm missing the administrator's password. Is there any software like Rufus that you can recommend me to get the password. Thanks in advance!! Cheers!!! Do you mean the BIOS password? That's a tricky one, and may not be possible on your own. Take a look at BIOS Password Backdoors in Laptops. That may help. If it doesn't, you may need to call HP for further assistance. So we couldn't help. BIOS passwords are a tricky area. I have tried to download Windows 7 Professional Edition 64 bits ISO File from the Microsoft Software Recovery site. My Product Key was verified successfully and ask to choose the language from dropdown menu.. Surprisingly, there was no English language on offer.. I am download from Brunei and although English is not our first language but everything in this country is in English. Note: I bought my Windows 7 DVD in box while I was on business trip to New York few years back. I have tried to download Windows 7 Professional Edition 64 bits from the Microsoft Software Recovery site. I want to reinstall windows 8.1, however I can't seem to find an .iso file to select in Rufus... There is however a MS-DOS file? What should I do? You will have to have a Windows 8.1 .iso file on your computer first. Then click on the icon that looks like a DVD and drive at the end of the line that reads, "Create a bootable disk using". Ignore the drop down box. Navigate to the .iso file and select it. Then carry on with the process. No thanks. Appreciate the offer, but I've got more old computers than I can shake a stick at. I was just thanking you for your compliment on the article. Thank you, Fredrick. That's a nice compliment. It is a shame that they took it down. After all, it wasn't anymore unsecured than the original install disks. Now, people will have to use pirated files just to recover an authentic install. So those systems could be wide open and the end result will be more MS-Bashing. This article is way too long for the title. Also, the list of Windows ISO file links do not work. Microsoft took down those links just days after this article was published. At this time, there is no other official way to get the ISOs than the Microsoft Software Recovery site. As long as you have a valid, non-OEM key. Will an sd card work the same way.? If you can set your computer's BIOS to boot from an SD card, then yes, you can. A good coverage of a question I have been searching for a few weeks...1 problem; I downloaded and install Magic Jellybean from the link...full of malware, luckily I had created a restore point before installing, but had to spend a few hours scanning after restoring! Kind of put a damper on a fine article! Thank you Stu, good point, yet it's not exactly malware. It might best be described as crapware - stuff you don't want but gets loaded because Magical Jellybean gets paid to include it, which keeps the software free. By reading careful through the installation process, you can easily prevent the crapware from being installed. How to Bypass Installing Roll Around - Select 'Custom Install (Advanced) and then de-select 'Install Roll Around...", then click Next. Keyfinder will install and Roll Around won't. You can also uninstall RollAround from the Programs and Settings control panel, just like you would any other program. I hope that helps, Stu. And I hope that helps future readers of this article. Looks like the ISOs aren't available anymore to the public. "NOTE: Microsoft has stopped providing Windows 7 ISO images directly to the public. At this time your only option is to borrow a installation DVD from a friend or obtain a replacement media." Drat. Maybe we can take this as a sign that this article was popular? Well, if you have a valid Product Key, you can still get your ISO from the Microsoft Software Recovery site. Thank you, glad you liked it. :) I'm here to help. So, really, an ISO from one of the above download sources is of no real use to an OEM system, right? I didn't know one could create a bootable ISO of a running system. How is that done? And for the enfeebled, what is the system repair procedure? You could use one of the generic ISOs, but it may not have the device specific drivers and programs that the OEM version would. So, yes, it would work, but would probably take further tweaking. As far as a bootable ISO of a running system, its not quite exactly that. What I'm talking about there is making an image of your operating system, or clone, that could then be installed on another computer or, if you had to format the drive on this one, you could put on it. This article explains in more detail how to do that - How To Clone Your Hard Drive. Cloning your hard drive is an excellent way to create an absolutely complete backup of your hard drive. I have yet to encounter a case where a mismatch between OEM, Refurb, or Retail installs and media works for a recovery although I have only had two of them. The first was Windows XP Pro on a refurbished machine. I already had both OEM and Retail discs with which to try to recover the machine and neither would even let me try to run the startup repair saying that the media didn't match the installation I was trying to fix. I had similar result attempting to fix a Windows 7 HP Retail installation with an OEM disc. Instead of messing around for a few hours trying to get it to work, I just borrowed a neighbor's disc to deal with the XP issue and found the appropriate download from Digital River for the second. Another quick note: You can modify the Vista Ultimate and Win 7 Ultimate ISO images so you can install Home Basic, Home Premium, Pro, or Ultimate editions from the same disc. The determining factor is the Product Code used which must match the edition you want to install. Same experiences for me too, Bruce. But I've been able to do a clean install on Toshibas with a standard Windows XP Pro or 7 Pro installation disc.Toshiba's Windows install is heavily customized. Then I had to download all the special Toshiba drivers and such and install them afterward. It can be done, but it is a pain. I'd rather have the OEM image any day. What can you do with a bootable Windows 7 USB stick if your system has an OEM version? Must you buy another copy to get a legit Product ID to make it useful? Can you over-install it to an existing system to get a cleaned up OS while retaining settings and apps? Although Microsoft's tool won't work with OEM versions, you could create an ISO of your system prior to doing anything with it, to create a clean bootable version. Or an ISO of the recovery partition. If I understand correctly, the MS tool doesn't work with OEM versions partly because the OEM versions can be highly customized. Toshiba is well-known for doing this. The other part of it is that actual OEMs have a whole different licensing structure than just you and I. If you want to retain your settings and apps, the best bet would be to do a system repair. I hope that helps! Sorry guys. Not your classiest headline photo. Yeah, I was on the fence about it too. When I made it, it was funny to me, I actually laughed out loud. But I also knew it might not be appreciated by some. The editor and I talked about it, and figured it was worth a whirl. Some will like it, some won't. Trust me, I did not want to be 'that guy'. I often suggest this site to kids in my youth group, etc. for ideas. They know I am "the IT guy", so I get asked about good sites for learning, and this is always at the top of my list. You guys do a great job...keep it up! That was a valid opinion with good reasoning. I always welcome that sort of constructive criticism. Plus, hey, new featured image!